©>©BNP/BANDAI, NAS, TV TOKYO *Images may differ from final product. *Product may be subject to change. The all time favorite [Digimon] now comes in a deck ! You can summon Omegamon without [Evolution] ! Now join [The Chosen Children] and their Digimon into battle ! On sale May 26th (Sat.) 2018! 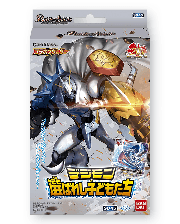 * The cards included in this pack may be used in official tournaments from May 26th (Sat.) 2018.